Phuket At its best, this island in the Andaman Sea is idyllic: It has long sandy beaches (some with dunes), warm water, excellent snorkeling and scuba diving off Koh Similan, ideal windsurfing conditions, mountains, fine resorts and some of the best seafood in all of Thailand. At its worst, it is overdeveloped, overrun with tour groups and areas like busy Patong's pulsing commercial strip and raucous nightlife are a bit too much for those in search of beachside tranquillity. Over the years, the Thai government has granted economic incentives to encourage developers to shape the island into an international first-class resort. Hotels -- some of them enormous -- line every beach. As groups pour in from Singapore, Hong Kong, and Europe, backpackers head off to nearby Koh Phi Phi, or islands on the eastern Gulf like Samui and Pha Ngan. But many of the resorts are attractive and elegant and designed to give you the illusion of tropical solitude in busier areas. It's nearly impossible to find a totally secluded beach, but there are a number of very attractive and comfortable facilities with a high level of service -- not a bad trade-off for those in search of all the luxuries. If on a family holiday, Phuket is a good choice. The name "Phuket" is derived from the Malay "Bukit," meaning hill, and hills dominate much of the islands interior. There are still some rubber plantations and a few open-pit mining operations going on. Going by rented car or taking a fun but touristy "safari" is a good way to get into the jungle or up the hills from which you'll have great views of the beaches below and the many surrounding islands and islets. 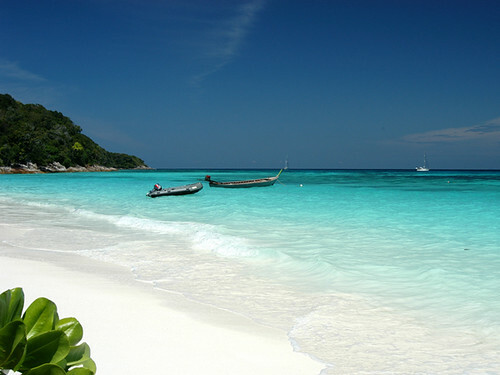 Most folks come for the beaches though, and Phuket's are indeed some of the best in Thailand. Take your shoes off, find a hammock, and relax. Thalang National Museum, in the east just off Highway 402 at the Heroine's Monument (tel. 07631-1426; daily 9am-4pm; 30B/75¢), exhibits Phuket's indigenous cultures, the history of the Thais on Phuket, and crafts from the southern Thai regions as well as a 9th century statue of the Hindu deity Vishnu -- evidence of early Indian merchants on the burgeoning kingdom. There are a few Buddhist temples on the island that are quite notable: the most unique is Wat Pra Tong, located along Highway 402 in Thalang just south of the airport. Years ago, a boy fell ill and dropped dead after tying his buffalo to a post sticking out of the ground. It was later discovered that the post was actually the top of a huge Buddha image that was buried under the earth. Numerous attempts to dig out the post failed -- during one attempt in 1785, workers were chased off by hornets. Everyone took all this failure to mean that the Buddha image wanted to just stay put, so they covered the "post" with a plaster image of The Buddha's head and shoulders and built a temple around it. Nearby Wat Pra Nahng Sahng houses three very interesting Buddha images made of tin, a local natural resource once considered semiprecious. Each image has a smaller Buddha in its belly. The most famous temple among Thai visitors is Wat Chalong. Chalong was the first resort on Phuket, back when the Thais first started coming to the island for vacations. Nowadays, the discovery of better beaches on the west side of the island has driven most tourists away from this area, but the temple still remains the center of Buddhist worship. While the temple compound itself is pretty standard in terms of modern temples, the place comes to life during Buddhist holy days. The temple is on the Bypass Road, about 8km (5 miles) south of Phuket Town. Sea Gypsies, considered the indigenous people of Phuket, are fast disappearing from the island and surrounds. Commercial fishing interests and shoreline development continue to threaten their livelihood of subsistence fishing. Related to Malaysian Orang Laut and the southern Thai Sakai tribes, Phuket and Pha Nga's Sea Gypsies form a few small settlements on Phuket island, one on Koh Sirey east of Phuket Town, and another at Rawai Beach just south of Chalong Bay. The villages are simple, floating shacks and long-tail boats. Visits to some of the larger settlements in Pha Nga Bay are included in many island day trips. It's an enlightening experience to visit these people and their disappearing culture. Be prepared for panhandling children. You can spend a lot of time on Phuket and still not do everything. Thanks to years of resort growth, there are a host of activities here and certainly something for everyone. The beachfront areas are full of tour operators, each vying for your business and offering similar trips (or copycat tours). Below are listed the most reputable firms but still ask lots of questions before signing up for anything (everything from safety precautions to the lunch menu) so there are no surprises. Haad Nai Yang National Park, 90 sq. km (35 sq. miles) of protected land in the northwest corner of the island, offers a peaceful retreat from the rest of the island's tourism madness. There are two fantastic reasons to make the journey out to the park. 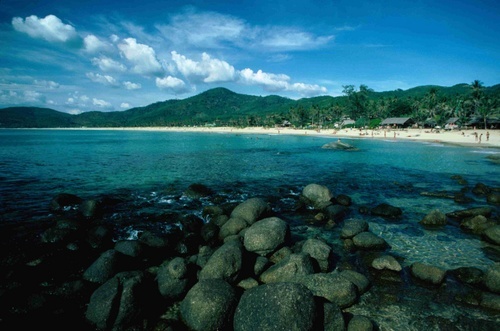 The first is for Phuket's largest coral reef in shallow water, only 1,400m (460ft.) from the shore. The second is for the giant leatherback turtles that come to nest every year between November and February. Park headquarters is a very short hop from Phuket Airport off Highway 402. Playful monkeys add a fun dimension to bars, restaurants, and guesthouses around Thailand, where the adorable creatures are kept as pets. Many times, however, these gibbons are mistreated. Raised in captivity on unhealthful food in restricted living conditions, and subjected to human companionship exclusively, many develop psychological problems. 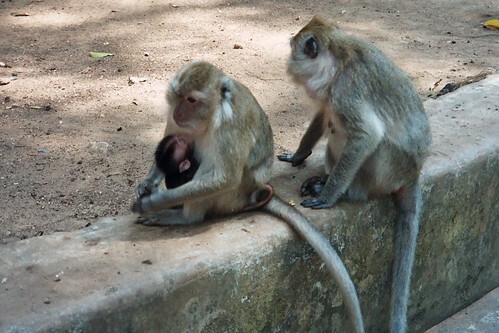 Depression and despondency become common for maladjusted monkeys, with violent outbursts occurring sometimes. Bar monkeys end up drinking alcohol, and are force-fed uppers to keep them awake and lively -- to the delight of tourists who aren't aware of the inevitable destruction it causes. The Gibbon Rehabilitation Project, off Highway 4027 at the Bang Pae waterfall in the northeastern corner of the island (tel. 07626-0492), cares for mistreated gibbons, placing them in more caring and natural surroundings (among other gibbons). Volunteer guides offer tours. Open daily from 10am to 4pm, admission is free, but donations are accepted and appreciated. The Phuket Aquarium at the Phuket Marine Biological Center seeks to educate the public about local marine life and nature preservation. Unfortunately most of the signs throughout are in Thai (very disappointing). Open 8:30am to 4pm daily, admission is 20B (50¢). Call tel. 07638-1226 for more information. The Butterfly Garden & Aquarium, Soi Phaniang, Samkong, Phuket Town (tel. 07621-5616), captures and breeds hundreds of gorgeous butterflies in a large enclosed garden. Photo ops are great, so bring film. The aquarium may not be as large as the Marine Biology Center's, but here the tanks are filled with great "show fish," fascinating for their beautiful or unusual appearances rather than for marine education. Open daily from 9am to 5pm, adult admission 150B ($3.40), children below 10 years of age 60B ($1.35). You'd never think seashells were so fascinating until you visit the Phuket Shell Museum. The largest shell museum in the world, this rare collection is simply beautiful. The gift shop sells a range of high quality shell products like big, beautiful whole shells that make great gifts if you can carry them. Open daily from 8am to 7pm, the museum is at 12/2 Moo 2, Viset Road, Rawai Beach (just south of Chalong Bay; tel. 07638-1266; admission 100B/$2.30, free for kids). To experience the wild side of Phuket's interior, try a rainforest trekking journey through the Khao Phra Thaew National Park. Phuket Nature Tour takes small groups through 3.5km (2 1/4 miles) of jungle paths past waterfalls and swimming holes. A typical half-day excursion includes hotel transfers, English-speaking jungle guides, and drinks. Call tel. 07625-5522. Then there's elephant trekking, a perennial favorite for children, and a great time for adults too. Elephants are not indigenous to Phuket so what you get here is more-or-less a pony ride, but arguments over captive elephant tour programs aside, the kids dig it (and the elephants do better here than when paraded around city streets for owners to collect coins). Siam Safari Nature Tours coordinates daily treks on elephants, Land Rovers, and river rafts. Their three-in-one Half-Day Eco-Adventure includes 4 hours of elephant treks through jungles to rubber estates, Jeep tours to see local wildlife, and a light river rafting journey to Chalong Bay. A full day tour is the three-in-one plus a trek on foot through Khao Pra Thaew National Park and a Thai lunch. Siam Safari's office is at 70/1 Chaofa Rd. in Chalong (tel. 07628-0116; www.phuket.com/safari). Siam Adventures (60/4 Rat-u-thit Rd. Patong Beach; tel. 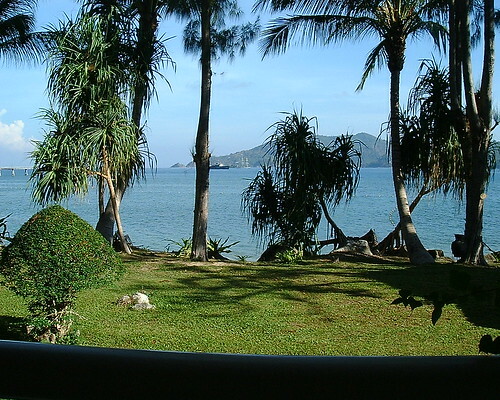 07634-1799) arranges similar adventures and is a leader in Phuket. If you've come to Phuket to escape and relax, there's no better way to accomplish your goal than to visit one of Phuket's spas. Even the smallest resort now offers full spa services (of varying quality) and you can find good, affordable massage along any beach and in storefronts in the main tourist areas. For luxury treatments, the most famous and exclusive facility here is The Spa at the Banyan Tree Phuket (see its listing earlier). In secluded garden pavilions you'll be treated regally and may choose from many types of massage, body and facial treatments or health and beauty programs. To make reservations call tel. 07632-4374 (ww.lagunaphuket.com/spa). Expect to pay for the luxury -- figure at least 2,000B ($49) per individual treatment. Another high-end resort in the furthest southeast of the island, Evason, makes for a great day-spa experience. They are a full-featured five-star with all the trimmings and their spa is renowned (similar to Banyan Tree's prices). They're at 100 Vised Rd. Rawai Beach, Phuket 83130 (tel. 07638-1010; fax 07638-1018; www.sixsenses.com). Let's Relax is a more affordable little day-spa in and among many similar services (some a bit dodgy really but this one is ok) just off of Patong (Rat-u-thit Rd. ; tel. 07634-0913). One hour Thai massage begins at 350B ($8.50).